The USTA Family Zone will be the place to be for young tennis players and the young at heart. 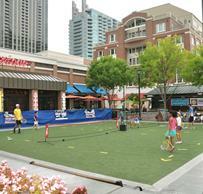 Come and enjoy hitting tennis balls and having fun on the USTA 36’ courts on Atlantic Station’s Central Park. Open free to the public, USTA staffers will have age-appropriate tennis racquets, balls, courts and nets for kids to exercise, hit a few balls and enjoy tennis. The courts will be open from noon-7 p.m. Please download waiver, sign it and bring it to the USTA Family Zone. Waivers are required to participate.